Haunted Barrel Candy Bar Porter will be released Saturday October 27th, along with two special barrel-aged variants, Haunted Maple and Haunted Joy. 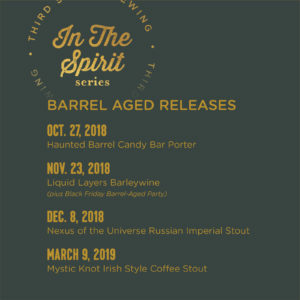 Milwaukee, Wisconsin (October 24, 2018) – Third Space Brewing launches the second year of its popular In the Spirit Barrel-Aged Series Saturday October 27th with the release of Haunted Barrel Candy Bar Porter. Haunted Barrel is an imperial porter brewed with a hint of coconut and aged for six months in rum and bourbon barrels with cacao nibs, vanilla, and cinnamon added. It is the ultimate adult trick-or-treat beer, arriving just in time for Halloween. Two special and limited variants will accompany Haunted Barrel this year: Haunted Maple and Haunted Joy. Haunted Maple was aged in a maple bourbon barrel with maple syrup, maple sugar and vanilla added. Haunted Joy was aged in a bourbon barrel with cacao nibs, vanilla, coconut and almond added (think Almond Joy candy bar). All three beers will be released on draft at 11:00 a.m. in Third Space Brewing’s taproom at 1505 West Saint Paul Avenue in the historic Menomonee Valley. Third Space will also sell a limited number of each beer in bottles, also commencing at 11:00 a.m. Haunted Barrel will be sold in 750ml bottles and the two variants will be sold in 500ml bottles. All bottles are $20 each. The variants are more limited than Haunted Barrel. Liquid Layers, a spiced barleywine with four draft-only barrel-aged variants, maple bourbon-aged, rye-aged, bourbon-aged, and port wine-aged. Draft Release Date: November 23, 2018 (Black Friday). Nexus of the Universe, a Russian Imperial Stout aged in bourbon and brandy barrels for nine months with cacao nibs and vanilla added. Bottle Release Date: December 8, 2018. Mystic Knot, an Irish-Style Coffee Stout aged in whiskey barrels for 7 months. Bottle Release Date: March 9, 2019. For the Haunted Barrel release on October 27, Taqueria La Guacamaya Food Truck will be in attendance to serve both breakfast and lunch. To get everyone in the Halloween spirit, Third Space will be giving away a set of last year’s Haunted Barrel and it’s variant, Haunted Hazelnut, to the wearer of the staff’s favorite costume among those in line for the bottle release.